(University of Pittsburgh Press, 2012) and Burn and Dodge (University of Pittsburgh Press, 2008), winner of the AWP Donald Hall Prize in Poetry. She was a featured poet at the 2012 Dodge Poetry Festival. Her other honors include the Pushcart Prize, a Fulbright fellowship, and artist residencies at Yaddo, MacDowell, Fundación Valparaiso in Spain, and the VCCA Moulin à Nef in France. She teaches at the Unterberg Poetry Center of the 92nd Street Y and directs The Center for Book Arts Annual Letterpress Poetry Chapbook Competition. When did you first discover the sestina? Do you remember the first sestina you ever read? Wrote? What’s your favorite sestina? Now that I teach beginning poetry classes at the college level, it seems de rigeur to spend a week on the sestina and to insist that students write one. So I’ve compiled some of my favorites for them in a handout and they include: Elizabeth Bishop’s disarmingly simple, yet heartbreaking “Sestina”; Noelle Kocot’s wickedly demotic “Sestina for Lizette”; Jan Clausen’s working class use of “pink” in “Sestina, Winchell’s Donut House”; Patricia Smith’s “Ethel’s Sestina” with its fabulous breaking of the form in the last sestet to enact the death of the speaker; and Terrance Hayes’s imaginative “Liner Notes for an Imaginary Playlist.” Zuk’s “Mantis,” of course, remains my favorite because it’s the most ambitious. “Praying Mantis in Brooklyn” is an update or response to Louis Zukofsky’s “Mantis,” complete with an after-poem interpretation. What drew you to do this? I imagine writing a poem centered around the mantis, which you write is “a symbol/which eschews the symbolic,” to be more than a mere exercise. As I mentioned above, I had read Zukofsky in graduate school. Then I was living in Brooklyn, in what was then untrendy Carroll Gardens, having recently lost my job and living on unemployment insurance, and so for several months I gave myself the time and license to write poems. I am superstitious enough to believe in coincidences being signs from the hidden world. So when a mantis literally perched on my window sill on the top floor of my walkup, and then, again, came to rest on my gate, I took it for a sign, especially since it happened on the Jewish High Holidays. Zukofsky, in the 1930s, had experienced a similarly uncanny encounter with a mantis when it flew at his chest while he was riding on the New York subway and that’s what had inspired him to write the poem. He, too, lived in Brooklyn. And here I was, a native Brooklynite, living in Brooklyn once more. It seemed like the only thing to do: to write the poem as a sestina with a free verse coda, just as he had done. Of course I meant it as an homage to him. I think of myself as being the grandchild of William Carlos Williams but also of Marianne Moore, whose use of the syllabic gave her prosy constructions a certain kind of shape. I was drawn to the idea of doing something formal, yet elastic, as the sestina can be, and then letting it rip in the free verse “‘Praying Mantis,’ Extemporized,” as Zuk had done. And doesn’t the mantis remain a remarkable creature? It’s the only insect I know of where there was a legal prohibition against killing them; you would be fined. They remain almost a fetish, in the sense of a creature worshiped for its magical powers. It was also a time in New York City, the late Eighties/early Nineties, and these times go in cycles, where the word and the idea of “the homeless” to describe a group of people came into our culture awareness. I knew times were not as bad as the Depression, but I wanted to use the mantis as a symbol that “eschews the symbolic.” In the same way that the poor don’t need a symbol; they just need to be recognized for who they are. It’s a funny coincidence—more than a coincidence—though, that the number of lines of the sestina does match the number of legs of a mantis. “Reluctant Sestina” is part of a wonderful tradition, namely the sestina that addresses the writing of a sestina. You’ve written several sestinas over your poetry writing life–what draws you to returning to this form? To be frank, I loved the online Sestina section of McSweeney’s and, since it had been at least a decade since I’d written a sestina, I thought I’d try my hand at one. I had begun jumping on a trampoline, and in a kind of jokey homage to an old boyfriend who bragged he could (and did) put anything into a college essay (Bugs Bunny, my name), I gave myself the challenge of getting the trampoline and my son into my sestina. I think I’d also begun to use more rhyming in my poems, having begun to write a series of ghazals and so you’ll notice the rather show-offy internal rhymes in the first stanza. There’s a built-in challenge to writing a sestina: Can you keep it going—keep those end words up in the air through six full stanzas and then an envoi? The more I write, the more I’ve learned (and taught my students) to write into their resistances rather than write around them. So I had some resistance to writing a sestina and, in effect, made that resistance the subject of the poem. I guess I had in mind those famous sonnets that also talk about/resist their sonnethood, Wordsworth’s “Nuns Fret Not in Their Convent’s Narrow Rooms;” Keats’s feeling “chain’d” by the “dull rhymes” of the sonnet in his “On the Sonnet;” Billy Collins’s jokey “Sonnet” that begins: “All we need is fourteen lines, well, thirteen now.” “And in this line there now flail five dull feet” is such a blatant echo/parody of Pope’s famous self-conscious line about the iambic pentameter line “And ten low words oft creep in one dull line.” So it felt to me like our poetic tradition is full of examples of poets resisting a form while using it. And being something of a contrarian, I liked that idea for my sestina. I believe that once a poet has demonstrated they can do a fixed form following all the rules, then it’s okay to take wild liberties with it. So in my most recent book, Whirlwind, I have another jokey sestina, though some might quarrel with my labeling it as such, called “Forward Sestina (Dylanesque),” in which I take the line from Bob Dylan “I Want You So Bad, Honey” and string it as the beginning , rather than the end, words in the sestina pattern as the poem’s scaffolding. 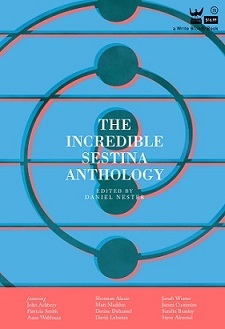 Finally, the first sestinas were always dedicated to someone—to whom would you dedicate your sestina(s)? “Praying Mantis in Brooklyn” is dedicated to Zukofsky, of course, “Reluctant Sestina” to my son and my trampoline. This entry was posted in Behind the Sestina and tagged Behind the Sestina, brooklyn, louis zukofsky, mantis, Poetry, praying mantis in brooklyn, reluctant sestina, Sestina, sharon dolin, The Incredible Sestina Anthology. Bookmark the permalink.